In January 2015, the United States Hockey League (USHL) conducted the USHL/NHL Top Prospects Game at the Mystique Community Ice Center in Dubuque, Iowa. This is a chance for the NHL hopefuls to shine and get noticed before the draft. The Team East defeated Team West. However, many players came on top. They include NHL draft eligible Youngstown Phantoms forward Kyle Conner, Waterloo Black Hawks teammates Brock Boeser and Tom Novak who are regarded as A-rated. They are not only top rated skaters but also potential first-round picks for 2015 NHL draft. 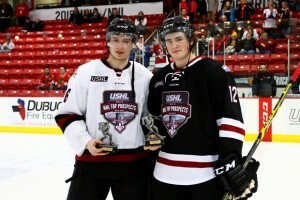 USHL is a great league to help develop future NHL players on ice as well as off the ice as a person. As the nation’s top junior ice hockey league classified as Tier 1, the USHL has 17 member teams mainly located in the Midwestern region. The comparable Canadian Hockey League (CHL) has only three members. Players are 16 to 20 years of age. Players are not only amateurs but also compete in the NCAA college hockey tournaments. CHL pays a stipend for its players while USHL doesn’t pay its players. Players are usually enrolled in college or working. Draft to recruit for NHL take place in second week of May each year and conducted in two phases.